SEOUL, Dec. 24 (Yonhap) -- Two North Korean soldiers who arrested female U.S. journalists on the border with China in March have been treated like heroes, according to North Korean media reports monitored here on Thursday. The North Korean soldiers, Son Yong-ho and Kim Chol, appeared on a special program of the Pyongyang-based Korean Central TV Broadcasting Station and reflected on the moment they detained the two American journalists -- Laura Ling and Euna Lee of the San Francisco-based Internet outlet Current TV. During the TV program produced to celebrate the inaugural anniversary of North Korean leader Kim Jong-il, the master of ceremonies disclosed that North Korean leader Kim gave the "Kim Il-sung Youth Honor Award" and a special leave to the North Korean border guard soldiers for their "feat" in the arrest of the U.S. journalists. Kim Il-sung, the founder of North Korea, is the father of leader Kim Jong-il. In the TV program, soldier Son said that he received a hero's welcome when he visited his hometown on a special leave. "I arrived in my hometown like a triumphant general. All residents came out to give me wreaths of flowers. A top local official even gave me a ride on his shoulder," said Son. 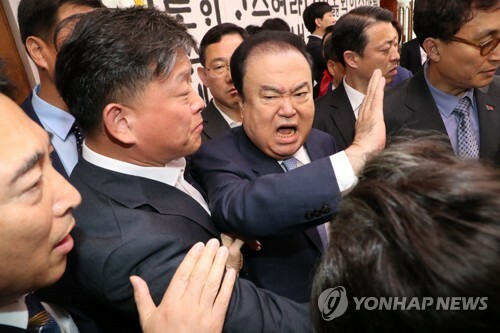 He also recalled the American reporters' arrest, saying, "On the early morning of March 17, we arrested the people as they appeared to have hostile purposes. One of the Americans offered us money begging for mercy, but we flatly turned down the offer." Laura Ling and Euna Lee were arrested in March on the China-North Korea border while reporting on refugees fleeing the isolated state. They were sentenced in June to 12 years in a labor camp for an unspecified "grave crime" and illegal border-crossing. But they were pardoned and freed in early August after former U.S. President Bill Clinton visited Pyongyang to negotiate their release.